In ZUST Needles we specialize in the manufacture of injecting needles for processing all types of bone-in or boneless meat, poultry and fish products. All our needles are made of the highest quality stainless steel (AISI 316) and combine both hardness and flexibility that make them work much longer than the traditional needles. We provide a variety of options regarding tube diameter, wall thickness, holes number and location. Individual designs with no extra costs! With our needles you can minimize the risk of bacteria growth inside of them. Brine-flow friendly construction will help you maintain the desired yield level. Both internal and external parts of our needles are electro polished what reduces the bacterial adhesion and makes our needles free of any obstacles for longer! We produce needles suitable for all red meat, pork, poultry and fish injectors. Most common brands we produce replace needles for: Inject Star, Ruhle, Shroder, Gunther, Fomaco, Nowicki, Suhner, Metalquimia, Garos, Pokomat, Belam, Dorit, Lutetia and many more. We also produce tenderizing knives but not for all types of machines yet. There is no minimum order quantity! All our needles are produced using stainless steel AISI316 with an addiction of titanium. This makes them strong, flexible and stay sharp for longer. If necessary, we supply needles with food grade rubber o-rings (NBR 70 or similar). Most common needle diameters we use (for each diameter various internal diameters available): 1,6mm; 2mm; 2,5mm; 3mm; 3,5mm; 4mm; 4,5mm; 5mm; 5,5mm. We also produce combined diameter needles using pulled or connected tubes (for example 1,6mm/2,2mm; 2mm/3mm; 2,5mm/4mm; 3mm/4mm). We know how important the internal areas of needles are to maintain best yield, efficiency and proper cleaning. Highly electro-polished surface of our needles reduces the risk of clogging. By optimizing the internal construction of each needle we minimized the possibility of the rest of brine to gather inside of the needle. This means that we reduced the bacteria growth and increased the safety of your customers. For any quantity we can adjust the internal tube diameter, number of holes, diameter of holes and their placing to obtain the best injecting results. No matter if you use a runny or a thick brine, thick meat pieces of thin fish fillets. We will help you to obtain the desired yield level. All our products are dedicated to suit the above-mentioned brands of injecting machines. These brands are registered trademarks that belong to companies who own them. 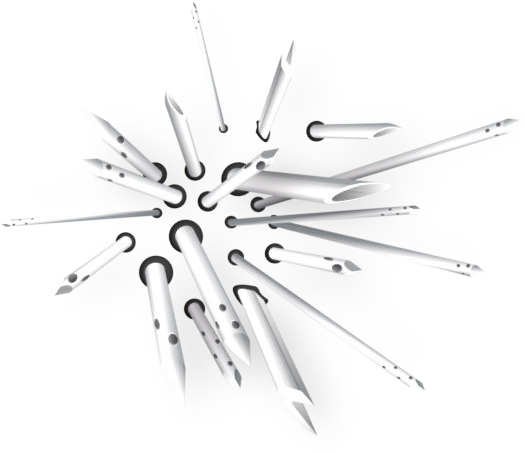 Replacement needles for: Inject Star®, Rühle® (Ruehle®), Günther® (Guenther®), Schröder® (Schroeder®), Dorit®, Metalbud Nowicki®, Fomaco®, Lutetia®, Metalquimia®, Townsend®, Pökomat®, Inwestpol®, Karpowicz® and many more.